Home//Zooper Doopers ….. more like Zooper Bloopers! Get ready for your mind to be blown and your stomach to feel sick with disgust! Yep, we get that’s a really big call to make but we stand by it. Those brightly coloured ice-pops that get handed out at school (or sold in the tuck shop) are quite frankly a chemical sh*t storm. We would personally like to see them banned in schools, or at least have The Daily Drink Co change the ingredients so they’re not made up of the following. Water, Sugar, Food Acid (Citric Acid), Flavours, Colours (122, 150d, 110, 102, 123, 133), Preservatives (202, 211, 223). This should be ok, right?! It’s just water…..but the interesting thing to note when water is listed as an ingredient, it generally means there will be a preservative of some kind added to keep it shelf stable. And what do we have here…..not one preservative but three (202, 211 and 223)!!! This highly addictive white powder is listed second, which means it’s the next highest ingredient in terms of volume. We all know sugar is not good for us, right? Well, there is roughly 12g of sugar per small tube of ice-pop! That is around three teaspoons of sugar per tube!! For the most part, this is fine. The Environmental Working Group (EWG) classifies this as ‘not expected to be potentially toxic or harmful’ and a ‘low human health priority’ (1). So, what are these ‘chemicals’? We simply don’t know, and companies aren’t bound to reveal that to us either! So, just to make it very clear – you have no idea what you are eating in these ice-pops! Artificial colours are often tested on animals and are made by combining various aromatic hydrocarbons like toluene, xylene and benzene, which are obtained from the distillation of bituminous coal. Coal tars are also made from petroleum distillates. To put it simply – artificial food colours are chemically produced and derived from petroleum, a crude oil product. Think gasoline, diesel fuel, asphalt and tar. The Southampton University conducted a study on six artificial food colourings 102,104, 110, 122, 124 and 129. 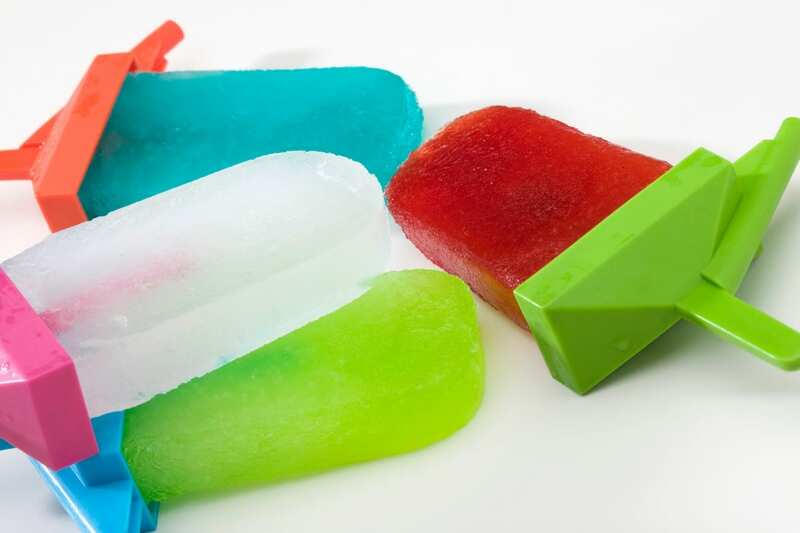 It was concluded that when these colours are mixed with sodium benzoate (210-2180), a common preservative and one which is found in these ice-pops, it caused direct behavioural changes in children. As a result of this, it has become mandatory in Europe for a warning label to be included on the packaging of all food that contains these artificial food colourings. The warning label states that the consumption of the product may have an adverse effect on activity and attention in children. Are we required to have that same label here in Australia? Unfortunately, no! All pretty gross huh?! And, to make it even worse, you will find artificial colours in a LOT of food! Sorbates occur naturally in some fruits – true, so why are we worried about it? Well, it is the fact that it is synthesised and no longer in it’s natural form that concerns us. When food is 100% natural it contains a range of things – fibre, proteins, vitamins etc and our bodies can distinguish the difference between fake and real. The human body is good at processing real food, it is not so great at processing fake ingredients. Potassium sorbate is a widely used preservative. It is added to food to inhibit the growth of moulds and yeasts that can cause foods to spoil. It is highly soluble, very cheap and easily produced making it a popular choice for many food companies. Benzoates occur naturally in lots of berries, vegetables, pepper, herbs, spices, peppermint and honey, but just like above, it is the synthetic versions that are of concern to us. Sodium benzoate is a synthetic chemical produced when benzoic acid is combined with sodium hydroxide. Sodium Metabisulphite is used as a food preservative and disinfectant. When it is dissolved in cold water it forms sulphur dioxide gas, which is why it should be avoided by asthmatics or anyone with respiratory issues. It is used to inhibit the growth of mould and bacteria on all surfaces it comes into contact with. It’s pretty full on isn’t it, specially given these products are targeted to children! It is scary to think how much potential damage a simple ice-pop can have, the long-lasting effects it may cause on our bodies and especially those little, growing bodies that need to be nurtured. There are other brands on the market which are derived from natural sources (such as Smooze and Proud & Punch) that are a much better choice. But we advise to always keep an eye out for the ingredient’s panels because companies can change their ingredients without us knowing. Better still, make your own. It’s so easy to buy ice-pop moulds and blend up some fruit with water and freeze them. Treat foods don’t have to be hard at all! If you want to know more about all sorts of additives and preservatives and what they all mean, check out our signature e-program Additive-Free Made Easy and register for our next round. So far, we have helped thousands of families to switch to an additive-free lifestyle simply and easily. I am shocked. This is terrible and they marketed so heavily at our kids. I also wonder how the get a 3 star health rating. Yes, we agree. It is not right that these sorts of things can be sold without warning labels (like in the EU). And the health star rating is a total joke, just saying!